Canada is a net exporter of most energy commodities and a significant producer of crude oil and other liquids from oil sands, natural gas, and hydroelectricity. Energy exports to the United States account for the vast majority of Canada's total energy exports. However, because of economic and other considerations, Canada is developing ways to diversify its trading partners, especially by expanding ties with emerging markets in Asia. Canada is endowed with abundant and varied natural resources, ranking fifth in 2014 among the largest energy producers in the world, trailing only China, the United States, Russia, and Saudi Arabia. Relatively energy intensive compared to other industrialized countries, Canada's economy is fueled largely by petroleum, natural gas, and hydroelectricity (Figure 1). Canada's oil sands are a significant contributor to the recent and expected future growth in the world's liquid fuel supply, and comprise most of the country's proved oil reserves, which rank third globally. In 2014, Canada was the world's fifth-largest crude oil and other liquids producer and a net exporter of oil (Figure 2). Virtually all of its crude oil exports are destined for the United States, because Canada lacks sufficient export capacity to send its liquids elsewhere. Canada is a major producer of crude oil. The recent growth in its liquid fuels production has been driven by bitumen and upgraded synthetic crude oil produced from the oil sands of Alberta. Most of Canada's proved oil reserves and the expected future growth in the country's liquid fuels production will be derived from these resources. According to the Oil & Gas Journal, Canada had roughly 173 billion barrels of proved oil reserves at the beginning of 2015, ranking it third in the world. Only Saudi Arabia and Venezuela hold higher reserves. In addition, Canada is one of only two countries among the top 10 proved reserves holders that is not a member of the Organization of the Petroleum Exporting Countries (OPEC). Canada's proved oil reserves from 1980 to 2002 were well below 10 billion barrels. In 2003, they rose to 180 billion barrels after oil sands resources were deemed to be technically and economically recoverable. Oil sands now account for approximately 166 billion barrels of proved reserves,1 nearly all of Canada's current proved oil reserves. Oil sands proved reserves saw a slight year-on-year decline in 2014. Nevertheless, oil sands production during the year continued to be robust, despite the decline in crude oil prices. Canada has a privatized oil sector that includes participation by many domestic and international oil companies. Many Canadian oil firms underwent strategic corporate restructuring, including consolidation, in the wake of the recent economic downturn. The technically sophisticated production processes required in the development of Canada's oil sands resources promote regional and functional specialization by independents and major oil companies. Many Canadian firms participate in upstream oil and natural gas ventures, from large-scale active or planned commercial projects to smaller pilot projects that serve as test beds for new technologies. The largest Canadian energy companies with a presence in the domestic upstream and downstream sectors include Suncor (which acquired Petro-Canada in 2009), Syncrude, Canadian Natural Resources Limited, Imperial Oil, Cenovus (which was spun off from Encana), and Husky Energy. Other Canadian companies, particularly Enbridge and TransCanada, dominate midstream pipeline infrastructure. The participation of international oil companies (IOCs), along with some national oil companies (NOCs) in Canada's oil sector has risen rapidly. Aside from economic and political motivations, investments in oil sands enable foreign companies to gain technological expertise that can be applied to unconventional resources elsewhere. While the Investment Canada Act stipulates that any large investment in Canada must be of net benefit to Canada, indicating possible limits on foreign control of strategic commodities, actual limits have been infrequent. U.S. companies involved in Canada's upstream and/or downstream oil industry include Chevron, ConocoPhillips, Devon Energy, and ExxonMobil. BP, Shell, Statoil, and Total are among the other major IOCs2 with producing or planned projects in the Canadian oil sands. Federal and provincial bodies coordinate policy and regulation in Canada. Provincial authorities, the largest and most influential of which is the Alberta Energy Resources Conservation Board (ERCB), handle most sector oversight. Canada's national regulatory body is the National Energy Board (NEB). Canada produced about 4.4 million barrels per day (b/d) of petroleum and other liquid fuels in 2014, an increase of more than 300,000 b/d over the previous year. Canada's production is on track to increase again in 2015, despite decreases in crude oil prices that have curtailed investment. Canada is expected to continue to be one of the largest sources of growth in non-OPEC liquid fuel supply. EIA's Short-Term Energy Outlook forecasts that Canada's liquids production will grow by 60,000 b/d in 2015 and an additional 90,000 b/d in 2016. While most of the increase will come from oil sands production, continued robust growth in natural gas production will generate increased output of natural gas liquids. Oil sands are a form of petroleum in a semi-solid state that is typically found blended with sand, clay, and water in its natural state. The existence of oil sands has been known for centuries, but commercial mining operation did not begin until 1967. It was not until the early 2000s, however, that the right combination of innovation and price spurred the growth in oil sands production. Nearly all of Canada's proved oil reserves are located in Alberta, 97% of which are in the form of oil sands, according to Alberta's provincial government.8 Alberta is also Canada's most prolific oil-producing region, where the surge in oil sands production has boosted total Canadian output to fifth globally. Within Alberta, there are three major oil sands deposits, the largest of which is the Athabasca deposit, followed by Cold Lake and Peace River. With experience and technological advances in producing hydrocarbons from oil sands, the cost of extraction falls. While previously more expensive than U.S. tight oil production, oil from oil sands in Alberta is now more competitive with U.S. tight oil production costs. Breakeven costs, which have been of particular interest in the wake of the oil price slide since mid-2014, vary greatly for oil sands projects. Although some of the large projects, such as Kearl Phase 1, show breakeven costs below currently prevailing crude oil prices, many other new projects' breakeven prices indicate that these projects are uneconomic in the current price environment. According to Citibank's breakeven analysis of Canadian oil sands projects, new pit mining projects see breakeven oil prices jump to as high as $95/barrel while in-situ new projects breakeven prices are above $80/b.10 Existing oil sands projects are at a lower risk of shut-ins due to low oil prices. Oil sands projects by their nature have very long pay-back periods and their profitability is evaluated in decades' long terms. Although low oil prices can affect oil sands production, this is not likely to happen in large scale to projects already operating, despite the current low prices. Canadian oil sands operators may see upgraders taken out for maintenance and remaining out of service for extended periods of time, but a large-scale shutting in of projects is very unlikely. Once extracted, bitumen is a heavy, viscous type of crude oil. To flow in a pipeline, the bitumen must be diluted with condensate or other light oils (upgraded) by complex processing units ("upgraders") into a light, sweet (low sulfur) synthetic crude oil (SCO). Syncrude Canada is a joint venture by leading oil sands operators in mining and upgrading operations in the projects of Mildred Lake and Aurora. Syncrude received regulatory approval for a roughly 200,000 b/d expansion in Aurora SouthTrain 1 and 2. Syncrude Canada's current production capacity is 350,000 b/d. Suncor Energy's oil sands production averaged approximately 420,000 b/d of upgraded bitumen and SCO in 2014.12 This production level is significantly below the company's total production capacity of more than 850,000 b/d, spread among mining and upgrading projects in Alberta's Athabasca region. Suncor has announced a number of planned greenfield and brownfield expansions in Chard, Lewis, Meadow Creek, Voyageur South, and additional stages to its Firebag and MacKay River operations. Suncor, in a joint venture with Total, began to develop the Fort Hills mine (160,000 b/d), which is expected to begin production in 2017. Shell Albian Sands is the leading owner and operator of the Athabasca Oil Sands Project, which includes the Muskeg River mine (155,000 b/d), the Jackpine mine (100,000 b/d), and the Scotford upgrader (255,000 b/d). Shell has received regulatory approval for expansions to its Muskeg and Jackpine operations, although the company has not yet announced a start date. Meanwhile, plans for its Pierre River project (which would add 200,000 b/d of oil sands production capacity to the company's portfolio) have been canceled. Canadian Natural Resources has two sizeable oil sands projects currently in production as well as a number of large planned projects. Its Horizon Oil Sands is an integrated mining and upgrading facility that can produce up to 152,000 b/d of light, sweet SCO in its first phase. Horizon will undergo process improvements and expansions over the next few years, with two phases planned to come onstream in 2016 and 2017. In addition, its Primrose and Wolf Lake operation has an in-situ capacity of 120,000 b/d. The company also began first-phase of operations at the in-situ Kirby project in 2013, with planned expansions for 2017 and 2022. in the next 10 years, Canadian Natural Resources aspires to construct other medium-sized in-situ projects, including Birch Mountain (120,000 b/d), Gregoire Lake, (120,000 b/d), and Grouse (40,000 b/d). Imperial Oil operates one of the largest in-situ projects, Cold Lake, which has a current capacity of 180,000 b/d, having expanded in January 2015 following the commission of the steam injection facility at the Nabiye expansion. The company is also operating its Kearl project, a 220,000 b/d mining operation, with the most recent expansion of 110,000 b/d brought online in June 2015. Future debottlenecking, which has received regulatory approval, is expected to increase Kearl production capacity to 345,000 b/d. Cenovus operates two large in-situ projects, Foster Creek and Christina Lake. Foster Creek was the first commercial SAGD project and now produces approximately 150,000 b/d, with additional phases in various stages of development. Phase G, the next stage slated to start production, is expected to begin during the first half of 2016. Phase H, however, was postponed indefinitely in response to declining crude oil prices. Christina Lake operates at a capacity of 138,800 b/d with expansion up to 150,000 b/d. Cenovus has also announced additional in-situ projects at East McMurray, Grand Rapids, Narrows Lake, Steepbank, Telephone Lake, and West Kirby. Devon Canada operates the in-situ Jackfish project, which includes three operational phases, each with a capacity of 35,000 b/d. The Pike project, which received regulatory approval, will have a total capacity of 105,000 b/d. The first phase of that project is expected to come online in 2019. CNOOC, with its Nexen acquisition, operates the Long Lake project. It includes a SAGD facility that is producing 92,000 b/d of bitumen, of which about 59,000 b/d of SCO will be produced from an upgrader that became operational in 2009. The next phase of Long Lake, Kinosis, has a planned capacity of 37,500 b/d. ConocoPhillips produces a total of 148,000 b/d at its Surmont in-situ project. Phase 2 of the SAGD project started in late May 2015, adding 118,000 b/d. Production is expected to ramp up through 2017. ConocoPhillips expects to have additional phases of Surmont online after 2020. Husky Energy operates the 30,000 b/d Tucker in-situ project north of Cold Lake along with the 60,000 b/d Sunrise Athabascan in-situ project. First production at Sunrise began in mid-March 2015, with additional phases approved, although the company has yet to announce anticipated start-up dates. MEG Energy operates 60,000 b/d of combined production from the first two phases of the Christina Lake in-situ project. A third phase, which has received regulatory approval, will add 150,000 b/d for a total project capacity of more than 200,000 b/d. MEG Energy's 120,000 b/d Surmont project is under regulatory review. Brion Energy, a subsidiary of PetroChina, purchased the Mackay River and 40% of Dover in-situ projects from Athabasca Oil Sands Corp. Currently, only Phase 1 of Mackay River has commenced production this year, with a capacity of 35,000 b/d. Once all phases are brought onstream, Mackay River is expected to produce 150,000 b/d. Statoil's presence in Canada's oil sands is focused on the Leismer in-situ project, currently operating at 10,000 b/d capacity; several phases and expansions are planned. Sunshine Oil Sands has announced three separate in-situ projects that it intends to bring online over the next decade at Legend Lake, Thickwood, and West Ells, with a combined future capacity of 290,000 b/d. To date, Sunshine has brought online the first phase of its West Ells SAGD project at 5,000 b/d. Total received regulatory approval for the 100,000 b/d Joslyn North mine, but the project has been put on hold because of costs and oil price declines. The company continues to participate in building its Fort Hills and Surmont projects. The traditional center of Canada's oil production has been the Western Canada Sedimentary Basin (WCSB), which stretches from British Columbia across Alberta and Saskatchewan to Manitoba and part of the Northwest Territories. The WCSB contains some of the world's most abundant supplies of oil and natural gas, and remains a significant source of conventional oil production, despite the fact that it was surpassed by output from oil sands in 2006. The depletion rates of traditional oil production in the WCSB are expected to fall in the coming years, because enhanced recovery techniques are applied to old wells and new resource deposits. In particular, technological advances in and the combination of horizontal drilling and hydraulic fracturing has made tight oil production from shale formations an increasingly attractive alternative to traditional production. The two most prolific tight oil plays in Canada are the Bakken, which stretches across southern Saskatchewan and Manitoba (as well as the northeast corner of Montana and North Dakota) and the Cardium formation in Alberta.13 The Bakken has been for a key component of the recent growth in U.S. crude oil production. Most offshore crude oil and other liquids production in Canada occurs in the Jeanne d'Arc Basin, off the eastern shore of Newfoundland and Labrador. Light crude oil production from offshore areas in eastern Canada averaged about 220,000 b/d in 2014, nearly 14% of Canada's total crude oil production.14 Most of Canada's offshore output comes from the ExxonMobil-operated Hibernia field, which came online in 1997 and produced about 115,000 b/d in 2014. Canada's offshore exploration and production is confined by many regulatory and legal impediments. A 1972 moratorium restricts field development off the Pacific coast, where there are an estimated 9.8 billion barrels of recoverable resources.17 A federal review of offshore drilling has resulted in limited E&P activity in the Arctic, but oil companies such as Imperial Oil, ExxonMobil, BP, and Chevron have secured acreage in the Beaufort Sea.18 However, drilling in the high-cost Arctic areas of Canada likely will be postponed for years, as the much lower crude oil prices since mid-2014 and the ensuing cuts in capital expenditures among oil producers have resulted in more conservative outlooks for Arctic oil exploration and development. Nearly all of Canada's oil exports were directed to the United States in 2014. Canada is the largest source of U.S. crude oil and refined products imports, accounting for about 37% in 2014. That year, the United States imported 3.4 million b/d of oil and petroleum products from Canada, of which 2.9 million b/d were crude oil, including diluents. While overall U.S. imports of crude oil are declining, Canada is one of the few countries from which U.S. crude oil imports are increasing. Over the past decade, U.S. imports of crude oil and other liquids from Canada have increased 58%, while oil imports from the other major suppliers have decreased, displaced largely by increased domestic production. The United States' net crude oil imports from Canada averaged 2.9 million b/d in 2014. Due to legal restrictions, Canada is the only country to import U.S. crude oil. Imports averaged 331,000 b/d in 2014, more than doubling year-over-year. Canada's petroleum product imports from the United States were 478,000 b/d in 2014. Nearly all of Canada's crude oil exports to the United States come from the western provinces,19 nearly 70% of which (1.9 million b/d) goes to the U.S. Midwest (Petroleum Administration for Defense District [PADD] 2). The U.S. Gulf Coast (PADD 3) imported 193,000 b/d of crude oil from Canada in 2014, accounting for only about 6% of its total imports. Although the Gulf Coast refineries are best suited to handle the heavier crudes coming from western Canada, the current pipeline infrastructure allows the Gulf Coast to import less than a tenth of the crude oil that is sent to the Midwest. 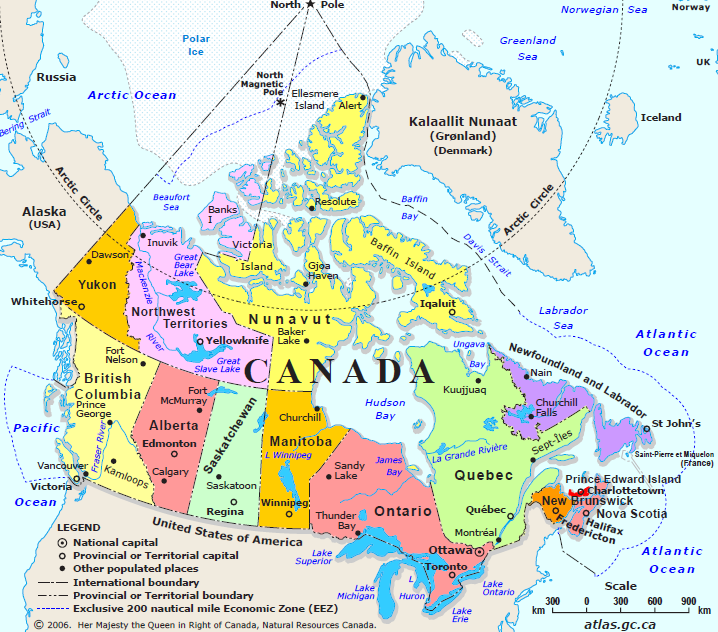 The eastern Canadian provinces, which are more densely populated but have less oil production, import some of the energy products they consume from the United States, including crude oil. Pipelines connect the centers of Canadian production with refining and export centers in the eastern provinces, western Canada, and especially the United States. Pembina, Plains Midstream, Spectra Energy, Access Pipeline, and Inter Pipeline operate some of the largest domestic pipeline systems in western Canada. Four companies operate the majority of the export pipelines: Enbridge, Kinder Morgan, Spectra, and TransCanada. In total, members of the Canadian Energy Pipeline Association transported 3.4 million b/d of crude oil and other liquids over approximately 25,000 miles of pipeline in 2014.20 However, an increasing volume of oil is transported by rail because of infrastructure constraints in the midcontinent region. Enbridge operates the largest Canadian export oil pipeline network. The Enbridge Mainline system, composed of the Canadian Mainline and the U.S. Mainline (Lakehead) pipeline networks, transports roughly 2.2 million b/d of petroleum and other liquids from western Canada, Montana, and North Dakota to the U.S. Midwest and eastern Canada. The Lakehead system includes the Alberta Clipper pipelines connecting Hardisty, Alberta to Superior, Wisconsin at a capacity of 450,000 b/d, following an expansion that was completed in August 2014.21 The Southern Lights pipeline lays parallel to the Alberta Clipper, but it runs in the opposite direction to transport lighter hydrocarbons back to Alberta for use as a diluent in transporting and processing bitumen.22 Along with its other smaller pipelines on both sides of the border, Enbridge's large pipeline systems transport 53% of the U.S.-bound oil exported from Canada. Enbridge, Kinder Morgan, and Spectra have new or expansion pipeline projects in development that would ultimately increase the pipeline capacity to deliver oil from Alberta to the U.S. Midwest and U.S. Gulf Coast, and servicing areas in between. Kinder Morgan aims to expand its existing Trans Mountain pipeline system by building a second pipeline within the same right-of-way. The expansion would increase Trans Mountain's capacity to 890,000 b/d. The rapidly increasingly supply of liquid fuels from the oil sands in western Canada has far outpaced pipeline capacity and the expansion efforts of the pipeline companies. With infrastructure already in place serving the demand destinations for western Canadian crude, rail has proven to be an adequate substitute. In 2014, crude oil transported by rail reached 185,000 b/d,31 of which 140,000 b/d were exported to the United States. Compared to the previous year, exports by rail increased 172%. In 2014, 51% of crude oil exports by rail went to the East Coast (PADD 1), 40% went to the U.S. Gulf Coast (PADD 3), and 7% went to the West Coast (PADD 5). Canada is one of the world's largest producers of dry natural gas and the source of most U.S. natural gas imports. Despite holding a smaller share of the world's proved natural gas reserves relative to crude oil, Canada ranked fifth in dry natural gas production and is a net exporter of dry natural gas (Figure 3). It is the fourth-largest exporter of natural gas, behind Russia, Qatar, and Norway. Although Canada has plans to export liquefied natural gas (LNG), all of Canada's current natural gas exports are sent to U.S. markets via pipeline. The U.S. Energy Information Administration (EIA) estimates that Canada's proved natural gas reserves were 67 trillion cubic feet (Tcf) at the end of 2014. Most of Canada's natural gas reserves are traditional resources in the WSCB, including those associated with the region's oil fields. Other areas with significant natural gas reserves include offshore fields near the eastern shore of Canada (principally Newfoundland and Nova Scotia), the Arctic region, and the Pacific coast. Significant deposits of unconventional natural gas reside in the WCSB in the form of coalbed methane (CBM), shale gas, and tight gas, although they have not been developed as extensively as similar formations in the United States. Canada has an estimated 573 Tcf of unproved technically recoverable shale gas resources, according to an updated assessment prepared by EIA. Five large sedimentary basins in western Canada with thick, organic-rich shales – the Horn River, Cordova Embayment, and Liard in northern British Columbia, the Deep Basins in Alberta and British Columbia, and the Colorado Group in central and southern Alberta – account for 536 Tcf of the total of technically recoverable shale gas resources. The Liard Basin claims the largest share of the total resource. The remaining assessed resources are in the potential shale gas plays of Saskatchewan/Manitoba, Quebec, and Nova Scotia. Exploration in these three plays has been limited. In 2014, Canada was the fifth-largest producer of dry natural gas, behind the United States, Russia, Qatar, and Iran (Figure 4). Canadian dry natural gas production, which had decreased from 2002 to 2013, rose by about 200 billion cubic feet (Bcf) in 2014. Most of Canada's natural gas production occurs in the prolific WCSB. Alberta produced nearly two-thirds of Canada's gross natural gas in 2014, according to the NEB,35 with most of the remaining volume coming from British Columbia. Although Canadian natural gas production has been generally declining as a result of reserve depletion, technological advances have spurred rapid investment in the country. Natural gas production from the WCSB will increasingly come from shale gas, tight gas, and CBM. A number of major and independent companies, including Encana, Apache, Devon, and Quicksilver, are active in British Columbia's Horn River shale play.36 Shale gas production in western Canada is currently relatively modest, and shale gas basins in eastern Canada are in even earlier stages of exploration and development. Virtually all of Canada's natural gas exports are transported to the United States via pipeline. In 2013, Canada began trucking very modest volumes of LNG to utilities in New England to meet inventory requirements in anticipation of winter demand in both 2013 and 2014. In 2014, total export volumes of LNG were less than one-third of an already modest amount that entered the United States in 2013. Canada also began exporting compressed natural gas (CNG) to the United States in 2014, totaling 303 MMcf. The United States imported 2.6 Tcf of natural gas from Canada in 2014, of which one-tenth of 1% (435 MMcf) was LNG and CNG combined. Total U.S. imports of Canadian natural gas are significantly lower than the peak levels of 3.8 Tcf in 2002 and 2007. Canada is the source of nearly all (about 97%) of U.S. natural gas imports, most of which come from western provinces. Although the United States is a net importer of natural gas from Canada, it exported nearly 770 Bcf of natural gas to Canada in 2014, increasing significantly from levels seen a decade earlier. As prospects for domestic U.S. natural gas production continue to improve, the United States is expected to require lower natural gas imports while exporting more to its trading partners. Kitimat LNG, a facility that was originally proposed as an import terminal, is now slated to become an export terminal, pending a final investment decision. Kitimat will initially process 1.3 Bcf/d of LNG, the feedstock for which will be shale gas produced in British Columbia. LNG Canada is another project approved for exports. Shell, in cooperation with Mitsubishi, KoGas, and PetroChina, is pursuing a two-train, 1.6 Bcf/d export terminal near Kitimat that would come online in 2020. LNG Canada received a conditional approval by the British Columbia government, although the final investment decision may not be made until mid-2016. As government policy attempts to lower domestic coal consumption, up to 50% of Canada's increasing coal production is being exported. Canada's total coal reserves stood at approximately 6.6 billion short tons in 2014, according to BP Statistical Review. More than 50% of the reserves are anthracite and bituminous coal. The remaining reserves are subbituminous and lignite coal.47 Coal resources are located across the country, but are actively mined and produced in only Alberta, British Columbia, and Saskatchewan. In 2014, Canada produced almost 69 million short tons of coal, a slight increase compared with the prior year. Roughly 50% of Canada's coal production is consumed domestically, a significant departure from a decade ago when Canada consumed nearly all of its domestic coal production. Increasing coal production and government policy aimed at reducing domestic coal consumption, along with the increased development of alternatives, has driven the increase in exports. Canada is a net exporter of electricity to the United States, and most of its power needs are met by hydroelectricity. Canada generated an estimated 616 billion kilowatthours (kWh) of electricity in 2012, of which 61% was hydroelectric. Only China and Brazil produce more hydroelectricity than Canada. Fossil fuel plants satisfy most of Canada's electricity needs not met by hydroelectricity. According to the International Energy Agency, approximately two-thirds of Canada's conventional fossil-fueled generation is fueled by coal, with most of the remaining amount generated using natural gas and a small amount using oil. Data presented in the text are the most recent available as of November 10, 2015. 1Alberta Energy Regulator, ST98-2015 Alberta's Energy Reserves 2014 and Supply/Demand Outlook 2015-2024, http://www.aer.ca/documents/sts/ST98/ST98-2015.pdf, accessed September 2015. 2Each IOC's website details its operations in Canada. 3Gault, Sebastian, "Alberta Oil in China: Concerns over Canadian investment regulations linger," Alberta Oil Magazine (January 9, 2014), http://www.albertaoilmagazine.com/2014/01/seekingthedragon-going-up/; Cattaneo, Claudia and Lewis, Jeff, "Life after CNOOC's Nexen deal: Is China's honeymoon with Canada's oil patch over?," Financial Post (December 7, 2013), http://business.financialpost.com/2013/12/07/life-after-cnoocs-nexen-deal-is-chinas-honeymoon-with-canadas-oil-patch-over/?__lsa=dc62-d035; U.S. Energy Information Administration, "Liquid Fuels and Natural Gas in the Americas," accessed September 2014, http://www.eia.gov/countries/americas/pdf/americas.pdf; Rocha, Euan, "CNOOC closes $15.1 billion acquisition of Canada's Nexen," Reuters (February 25, 2013), http://www.reuters.com/article/2013/02/25/us-nexen-cnooc-idUSBRE91O1A420130225. 5Alberta Energy Regulator, ST98-2014 Alberta's Energy Reserves 2014 and Supply/Demand Outlook 2015-2024, https://www.aer.ca/documents/sts/ST98/ST98-2015.pdf, accessed September 2015. 6Canada Association of Petroleum Producers, "Statistical Handbook for Canada's Upstream Petroleum Industry" (September 2015), table 3.7e, accessed September 2015, http://www.capp.ca/publications-and-statistics/statistics/statistical-handbook. 7Canada Association of Petroleum Producers, "Crude Oil: Forecast, Markets, and Transportation" (June 2015), accessed September 2015, http://capp.ca/publications-and-statistics/publications/264673. 9Government of Alberta, "Alberta Oil Sands Industry, Quarterly Update" (Summer 2015), accessed September 2015, http://albertacanada.com/files/albertacanada/AOSID_QuarterlyUpdate_Summer2015.pdf. 10Hussein, Yadullah, How High Breakeven Costs are Challenging New Oil sands Projects, http://www.financialpost.com/m/wp/blog.html?b=business.financialpost.com//news/energy/how-high-break-even-costs-are-challenging-new-oilsands-projects. 11Oil Sands Review, Canadian Oil Sands Navigator, accessed September 2015, http://navigator.oilsandsreview.com/listing; Government of Alberta, "Alberta Oil Sands Industry, Quarterly Update" (Summer 2015), accessed September 2015, http://www.albertacanada.com/files/albertacanada/AOSID_QuarterlyUpdate_Summer2014.pdf. 12Suncor, Annual Report 2014, accessed September 2015, http://www.suncor.com/pdf/Annual_Report_2014.pdf. 13National Energy Board, "Canada's Energy Production 2013 – Energy Supply and Demand Projections to 2035 – An Energy Market Assessment," Canada's Tight Oil Production, accessed September 2014, http://www.neb-one.gc.ca/clf-nsi/rnrgynfmtn/nrgyrprt/nrgyftr/2013/nrgftr2013-eng.html#fg2_2. 14Canada Association of Petroleum Producers, "Statistical Handbook for Canada's Upstream Petroleum Industry" (September 2015), accessed September 2015, http://www.capp.ca/publications-and-statistics/publications/258990. 16Husky Energy, Projects, accessed September 2015, http://www.huskyenergy.com/operations/growthpillars/atlantic/projects.asp. 17Natural Resources Canada, Offshore British Columbia, accessed September 2014, http://www.nrcan.gc.ca/energy/offshore-oil-gas/5843; Wood, Joel, "Lifting the Moratorium: The costs and benefits of offshore drilling in British Columbia" (October 2012), accessed September 2015, http://www.fraserinstitute.org/uploadedfiles/fraser-ca/Content/research-news/research/publications/lifting-the-moratorium-offshore-oil-drilling-in-BC.pdf. 18Canadian Broadcasting Corporation News, "Oil companies seek to drill in deep Beaufort Sea" (September 27, 2013), accessed September 2015, http://www.capp.ca/publications-and-statistics/publications/264673 http://www.cbc.ca/news/canada/north/oil-companies-seek-to-drill-in-deep-beaufort-sea-1.1871343. 19Canada Association of Petroleum Producers, "Crude Oil: Forecast, Markets, and Transportation" (June 2015), accessed September 2015, http://www.capp.ca/publications-and-statistics/publications/264673. 21Enbridge, http://www.enbridge.com/DeliveringEnergy/OurPipelines/LiquidsPipelines.aspx; Canada Association of Petroleum Producers, "Crude Oil: Forecast, Markets, and Transportation" (June 2015), accessed September 2015, http://www.capp.ca/publications-and-statistics/publications/264673. 22Enbridge, Alberta Clipper and Southern Lights, accessed September 2015, http://www.enbridge.com/Alberta-Clipper-and-Southern-Lights.aspx. 23Canada Association of Petroleum Producers, "Crude Oil: Forecast, Markets, and Transportation" (June 2015), accessed September 2015, http://www.capp.ca/publications-and-statistics/publications/264673. 24TransCanada, Oil Pipelines, accessed September 2015, http://www.transcanada.com/oil-pipelines.html. 25Canada Association of Petroleum Producers, "Crude Oil: Forecast, Markets, and Transportation" (June 2015), accessed September 2015, http://www.capp.ca/publications-and-statistics/publications/264673. 26TransCanada, Keystone XL Pipeline, accessed September 2015, http://keystone-xl.com/about/the-keystone-xl-oil-pipeline-project/. 27Davenport, Coral, "Report Finds Higher Risks If Oil Line is Not Built" (June 6, 2014), http://www.nytimes.com/2014/06/07/us/report-finds-higher-risks-if-oil-line-is-not-built.html. 28Canada Association of Petroleum Producers, "Crude Oil: Forecast, Markets, and Transportation" (June 2015), accessed September 2015, http://www.capp.ca/publications-and-statistics/publications/264673. 34Canada Association of Petroleum Producers, 2014 Statistical Handbook, accessed September 2015, http://www.capp.ca/publications-and-statistics/statistics/statistical-handbook. 35National Energy Board, Canadian Energy Overview, accessed September 2015 https://www.neb-one.gc.ca/nrg/ntgrtd/mrkt/vrvw/2014/index-eng.html. 36Hart Energy, Unconventional Oil and Gas Center, accessed September 2015, http://www.ugcenter.com/operators?business_type=operators&play=hornriver. 37ExxonMobil, Operations, Sable Offshore Energy Project, accessed August 2014, http://www.soep.com/cgi-bin/getpage?pageid=1/0/0. 38Canada-Nova Scotia Offshore Petroleum Board, accessed September 2015, http://www.cnsopb.ns.ca/offshore-activity/offshore-projects/sable-offshore-energy-project. 39Canada-Nova Scotia Offshore Petroleum Board, Offshore Projects, accessed September 2015, http://www.cnsopb.ns.ca/offshore-activity/offshore-projects/deep-panuke. 40TransCanada, 2014 Annual Report, accessed September 2015, http://annualreport.transcanada.com/2014/Content/PDF/TransCanada-2014-Annual-Report.pdf. 41TransCanada, "Keeping the Tanker Full Into the Future" presentation (January 23, 2014), http://governmentcaucus.bc.ca/mikemorris/wp-content/uploads/sites/45/2014/02/Keeping-the-Tank-Full-Premiers-BC-Natural-Resource-Forum-Jan-23-FINAL.pdf. 42Spectra Energy, Our Processing Business in Canada, accessed September 2015, http://www.spectraenergy.com/Operations/Business-Units/Western-Canada/. 43Enbridge Natural Gas Pipelines, http://www.enbridge.com/DeliveringEnergy/OurPipelines/NaturalGasPipelines, accessed September 2015. 44Canaport LNG, accessed September 2015, http://www.canaportlng.com/. 45BP, Statistical Review of World Energy 2015, accessed September 2015, http://www.bp.com/content/dam/bp/pdf/Energy-economics/statistical-review-2015/BP-statistical-review-of-world-energy-2015-full-report.pdf. 46National Energy Board, LNG Export License Applications, accessed September 2015, http://www.neb-one.gc.ca/clf-nsi/rthnb/pplctnsbfrthnb/lngxprtlcncpplctns/lngxprtlcncpplctns-eng.html. 47BP, Statistical Review of World Energy 2015, accessed September 2015, http://www.bp.com/content/dam/bp/pdf/Energy-economics/statistical-review-2015/BP-statistical-review-of-world-energy-2015-full-report.pdf. 48Natural Resources Canada, accessed September 2015, http://www.nrcan.gc.ca/energy/coal/clean-coal/4279. 49Global Energy Observatory, Current List of Hydro PowerPlants, accessed September 2015, http://globalenergyobservatory.org/list.php?db=PowerPlants&type=Hydro. 50Canada Wind Energy Association, Installed Capacity, accessed September 2015, http://canwea.ca/wind-energy/installed-capacity/. 51International Energy Agency, IEA Data Services, 2012.